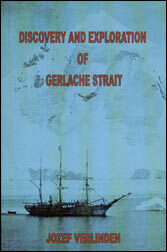 This book is an unique guide to the Gerlache Strait, which is now the centre of Antarctic tourism. It contains a summary of the Belgian Antarctic Expedition of 1897-1899, mentioning what the expedition members wrote about each of the landings they made in the Gerlache Strait area. Special attention is given to the geographical discoveries made in Gerlache Strait explaining after who or what each place was named. A modern map of Gerlache Strait is given in annex.